We offer a 10 Watt T8 LED tube, suited as energy efficient neon tube replacement to be used in professional and industrial environments. The LED tube comes with a luminous flux of 1076 lumen and 107 lm/watt light output in a clear embodiment. This 60cm version is built with 6000K color temperature (daylight white) in OEM quality. We offer a 10 Watt T8 LED tube, suited as energy efficient fluorescent tube replacement to be used in professional and industrial environments. The LED tube comes with a luminous flux of 1076 lumen and 107 lm/watt light output in a clear embodiment. This 60cm version is built with 6000K color temperature (daylight white) in OEM quality. The LED tube with G13 socket is designed to meet high professional quality demands for long-term stability and luminosity from professional users in offices, industry, offices and retail shops. 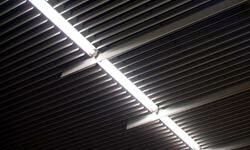 We only offer LED tubes that can meet these standards. The end covers can be turned by 180 degrees to ensure an optimized orientation of the light source to the object. This offers more flexibility when the tube is installed in a lamp that is mounted on the ceiling or used in Louvre luminaires. In underground car parks the light source can be focused on the parking area. We can offer technical support and consultation. Feel free to get in contact through telephone 0049-221-9924573 during our business hours. You can also send us an e-mail through our contact or get in contact through fax.